Gospel of Mark | Wake Up, Philippines! In today’s gospel’s account, Jesus who took Peter, James and John and led them up a high mountain apart by themselves “was transfigured before their eyes, and His clothes became dazzlingly white – whiter than the work of any bleacher could make them” (Mk 9:2-3). At the Transfiguration, Jesus’ face was no longer emptied (see Phil 2:7) of His divine glory. His face was clearly recognizable as the face of God. From the day Peter confessed that is Jesus is the Christ, the Son of the living God, the Master “began to show his disciples that he must go to Jerusalem and suffer many things…and be killed, and on the third day be raised (Mt 16:21). Peter scorns this prediction, nor do the others understand it any better than he (Cf. Mt 16:22-23; Mt 17:23; Lk 9:45). In this context the mysterious episode of Jesus’ transfiguration takes place on a high mountain (Cf. Mt 17:1-8 and parallels; 2 Pt 1:16-18), before three witnesses chosen by himself: Peter, James and John. Jesus face and clothes become dazzling with light, and Moses and Elijah appear, speaking “of his departure, which he was to accomplish at Jerusalem” (Lk 9:31). 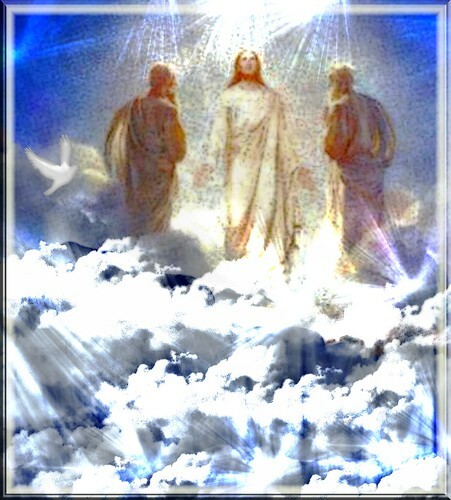 A cloud covers him and a voice from heaven says: “This is my Son, my Chosen; listen to him” (Lk 9:35) (CCC 554)! For a moment Jesus discloses his divine glory, confirming Peter’s confession. He also reveals that he will have to go by the way of the cross at Jerusalem in order to “enter into his glory” (Lk 24:26). Why? Because this is His Father’s will and as a Beloved Son in order to please the Father he is to serve and obey Him (see cf. Is 42:1). On this event, “the whole Trinity appeared: the Father in the voice; the Son in the man; the Spirit in the shining cloud” St. Thomas Aquinas, STh III, 45, 4, ad 2). What are the meanings and significance of the Lord’s Transfiguration that we read this gospel two times a year: on the 2nd Sunday of Lent and on August 6th? First, Jesus revealed his splendor and glory as the beloved Son of God to his disciples to strengthen them for the scandal of the Cross. “The Gospels report that at two solemn moments, the Baptism and the TRANSFIGURATION OF Christ, the voice OF the Father designates JESUS his ‘beloved Son’.[Cf. Mt 3:17 ; cf. Mt 17:5 .] JESUS calls himself the ‘only Son OF God’, and by this title affirms his eternal pre-existence. [Jn 3:16 ; cf. Jn 10:36 .] He asks for faith in ‘the name OF the only Son OF God’. [Jn 3:18 .] In the centurion’s exclamation before the crucified Christ, ‘Truly this man was the Son of God’, [Mk 15:39 .] that Christian confession is already heard. Only in the Paschal mystery can the believer give the title ‘Son of God’ its full meaning” (CCC 444). Jesus went to the mountain knowing full well what awaited him in Jerusalem – his betrayal, rejection and crucifixion. This will definitely scandalize his apostles. Hence, the need to reveal to his disciples his divine splendor and glory to strengthen them when that moment of crucifixion and death comes. Second, “The Transfiguration gives us a foretaste of Christ’s glorious coming, when he will change our lowly body to be like his glorious body” (Phil 3:21). “His glory shone from a body like our own, to show that the Church , which is the body of Christ would one day share his glory (see Preface of the Transfiguration). But it also recalls that “it is through many persecutions that we must enter the Kingdom of God” (Acts 14:22). Jesus possesses the glory, a manifestation of divinity, because He is God, equal to the Father. Hence he is entitled to all our reverence, worship, praise, petition, obedience of faith and love. He, like the father, has to be glorified too. Friends, for you and your salvation “you have been purchased by Jesus, and at a price. So glorify God in your body” (1 Cor 6:20). How? “The glory of God is a man fully human, fully alive!” (St. Ireneus). The longing and desire for heaven or the single indestructible longing for God, for an eternity spent in intimate, blessed communion with him is the deepest desire of human heart. Heaven is “the ultimate end and fulfillment of the deepest human longings, the state of supreme, definitive happiness” (CCC 1024). This is always what we pray for, what we strive for, what we hope for. But there were and will always be temptations, trials and tests on the way that will prevent us, hinder us and steal away from us the heaven that we long for. The Gospel for today tells of Jesus’ retreat and temptation in the desert and the beginning of his preaching of God’s good news. Today’s Gospel simply tells of Satan tempting Jesus. But Jesus passed the test and overcame the test and temptation. What is temptation? A temptation is anything than inclines a person to commit sin. It is enticement to evil, seduction to sin and death. Though it is not a sin it is more than trial or test because it lead us to sin. Once we enter into, give in to and submit to, temptation we are already committing sin which will bring us alienation, corruption, death and ultimately hell where Satan reigns and where there will be wailing and gnashing of teeth because of it unquenchable fire. What distinguishes temptation from trial? Trials or tests are necessary for growth while temptations incline us to sin. “No one who is tempted is free to say, “I am being tempted by God.” Surely God, who is beyond the grasp of evil, tempts no one” (Jas 1:13). God tests the heart puts his own in trial (1Th 2, 4) while only Satan tempts them (Lk 22,37; Ap 2, 10; 12,9). Trial is indispensable condition for growth (cf. Lk 8, 13ff), for sturdiness (1 P 1, 6f), for the manifestation of the truth (1 Co 11, 9: the reason for Christian divisions) and humility (1 Co 10, 12). When we overcome trials, temptations we are proven to be steady and strong (subok na matatag at subok na matibay. Thus freed, tried and tested Christian knows how to discern, verify and “try” everything (R 12, 2; E 5, 10). Trial is therefore the condition of the Church which is still to be tested, although she is already pure; stll to be reformed, although she is already glorious. St. Paul assures us that “God will not let you be tested beyond your strength. Along with the test he will give you a way out of it so that you may be able to endure it” ( 1 Cor 10:13; cf. CCC 2848). In fact St. Paul wrote that we should even boast of our tests/afflictions, knowing that afflictions produce endurance, and endurance, proven virtue (cf. Rom 5:3-5; CCC 2897). Some temptations arise from within ourselves. “The tug and lure of his own passion has conceived, it gives birth to sin, and when sin reaches maturity it begets death” (cf. Jas 1:14). Our passions and emotions incline us to long for attractive gratifications even through doing acts we know are evil. Pride incline us to sin. Imperfection of our very nature are sources of sin more particularly concupiscence and bad habits or vices. We also experience temptations from the world. Persons, places and things can be occasion of sins to us. Even things good in themselves can be incitements in us to seek the attractive goods in unreasonable ways. Faith also recognizes Satan, once an angel, but now hostile to God and to us, as one source of temptation. In his hatred for God, he seeks to drive us toward sinful and self-destructive choices (CCC 394-395). Consequence of being tempted: slavery to sin, alienation and separation, death and ultimately hell where Satan dwells and where Satan reigns and where there will be wailing and gnashing of teeth because of it unquenchable fire. How do we handle with temptations? Avoid temptations and keep yourself busy. Idleness is the workshop of the devil. Resistance, faith and vigilance. Stay sober and alert because your enemy the Devil is like a prowling lion, waiting for someone to devour. Resist him and solid in your faith. Prayer. In communion with their master, the disciples’ prayer is a battle; “only by keeping watch in prayer can one avoid falling into temptation” ( cf. Lk 22:40, 46). “Pray that he will not let you be tested beyond your strength” (cf. 1 Cor 10:13). Pray that the Father “lead us not into temptations and allow us to be overcome by it (cf. CCC 2846). Nothing is equal to prayer; for what is impossible it makes possible, what is difficult, easy…Those who pray are certainly saved; those who do not pray are certainly damned. Repentance and conversion. Always return to the Lord with fasting, weeping and mourning. For he is gracious and merciful, slow to anger, rich in kindness and relenting in punishment. Seek first the kingdom of God and his righteousness. Always seek in everything the will of God. Nothing more, nothing less and nothing else. Temptations are not themselves sins and no one entirely escape temptation. Hence, be vigilant and pray that God our Father may “lead us not into temptation” or allow us to be overcome by it and “seek it with all our hearts His sufficient grace to overcome temptation and to remain faithful to God (cf. CCC 2848).